Nature’s Sunshine combines Vitamin A and D in this powerful formula to provide all the benefits of both vitamins. Vitamin A, found in animal tissue as retinol but in plant tissue as carotene, supports the epithelial cells and promotes immune system health as well as assisting in the body’s digestion of protein. Vitamin A also is a necessary nutrient for lactation, reproduction, and formation of steroid hormones. It is also essential in cell formation in the digestive, respiratory, reproductive, and urinary systems as well as nourishing the skin and providing powerful antioxidant properties. 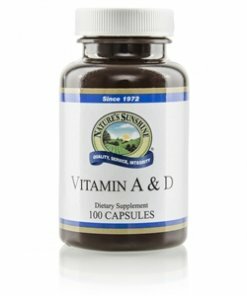 200 percent daily value or 10,000 IU of vitamin A is contained in each Vitamin A and D Capsule. Vitamin D supports the benefits of Vitamin A while also providing its own essential benefits. It helps the body absorb calcium and phosphorus, synthesize protein, and support the structural system. Vitamin D is also essential in nervous system function and kidney function. Known as the “sunshine vitamin,” vitamin D is produced when rays of sun interact with skin oils. Older or tan skin does not produce as much vitamin D, so supplementing this key vitamin is essential to bodily health. 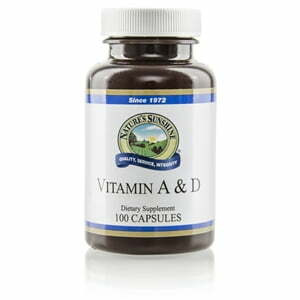 Nature’s Sunshine Vitamin A and Vitamin D formula provides 100 percent daily value, or 400 IU, of vitamin D.